Assange, an Australian citizen, will receive consular assistance on Friday but won’t be given any “special treatment”, the country’s prime minister, Scott Morrison, said. The country’s defence minister, Marise Payne, said Assange’s potential extradition to the US was an issue between the UK and the US. 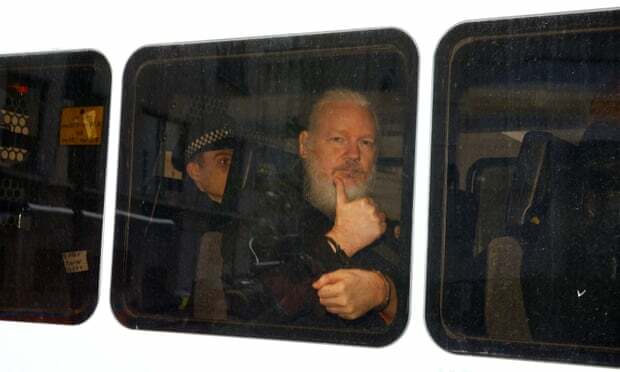 One Assange supporter, who witnessed the arrest, said: “There were at least six men dragging Julian out and more uniformed police standing by. Julian was talking but he was bundled into a van. He looked dazed. Explaining the decision, Ecuador’s president, Lenín Moreno, said: “In a sovereign decision Ecuador withdrew the asylum status to Julian Assange after his repeated violations to international conventions and daily-life protocols.” He accused Assange of interfering in the internal affairs of other countries, and added: ‘The patience of Ecuador has reached its limit.